Did you know that chocolate, cherries, almonds, cinnamon, coffee and cheese can be poisonous? I think you'll be fascinated at what you learn, experience, and discover in The Power of Poison at Fernbank Museum of Natural History! I do, however, recommend that you allow ample time to digest every dimension of this exhibition. 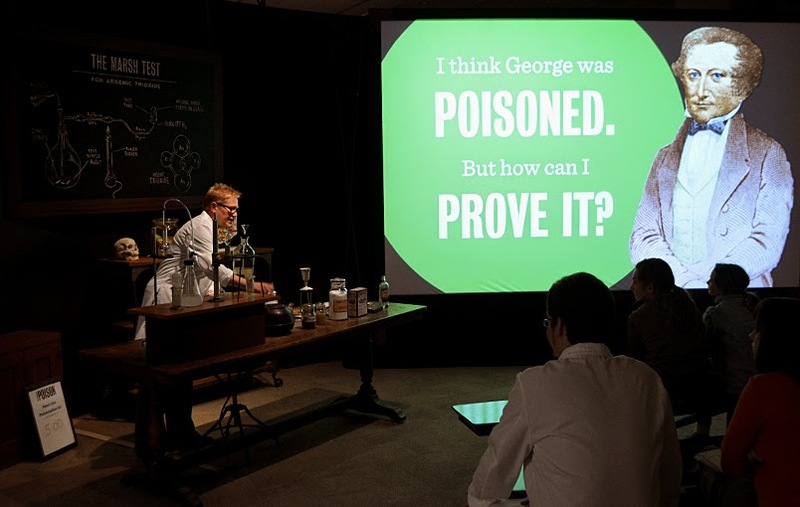 There are extensive features and displays and interactive stations, I really don't know where to start, but given the popularity of CSI-like television programs, let me tell you a little about the Live Science Shows that are part of The Power of Poison exhibition. The live shows are more lab-like, and the presenter(s) is wearing a lab coat, there are beakers and test tubes, and certain curiosities! Presentation attendees get to enjoy the fascination of the science and history of toxicology and poisoning...Seriously, doesn't that sound awesome? I didn't stop in for long, but when I go back, I want to sit in for a full "investigation"! 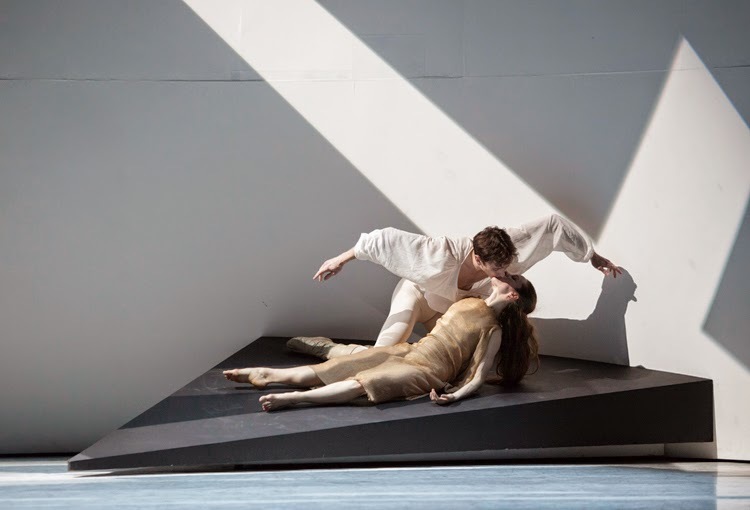 In addition to the show and other features in The Power of Poison, there's quite a bit of programming, including several Dangerously Delicious Tasting Events! 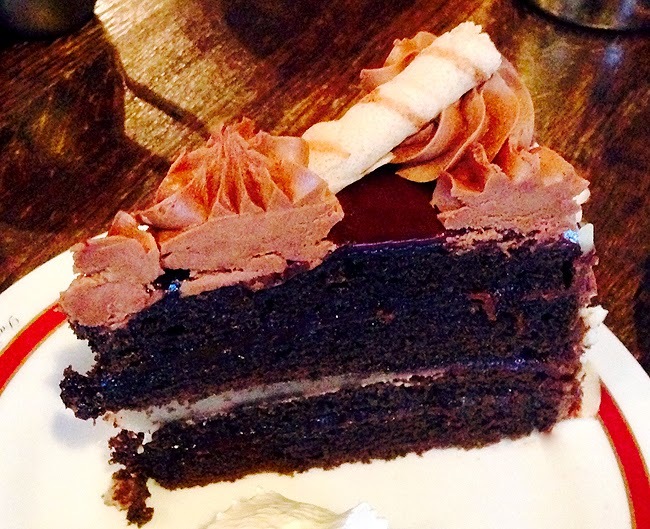 Click that link to learn more about the chocolate and cinnamon and other delectable items noted in my lead-in question. 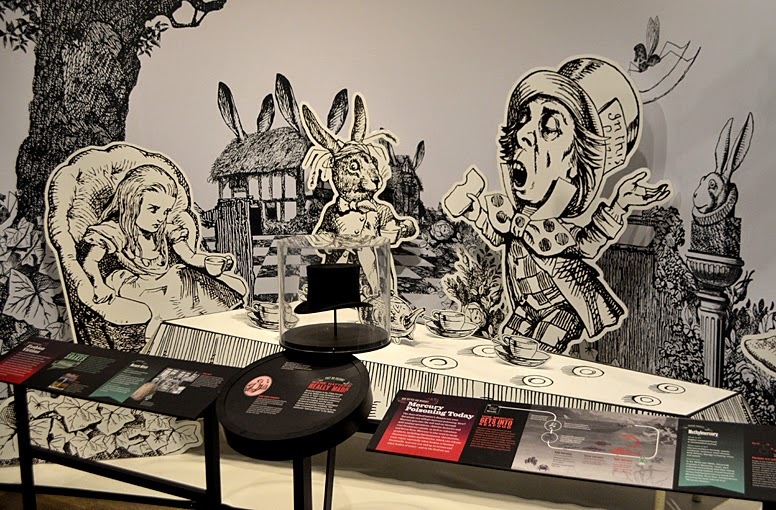 I think it's fantastic that the exhibition includes a nod to Alice in Wonderland, which celebrates its 150th anniversary in 2015. 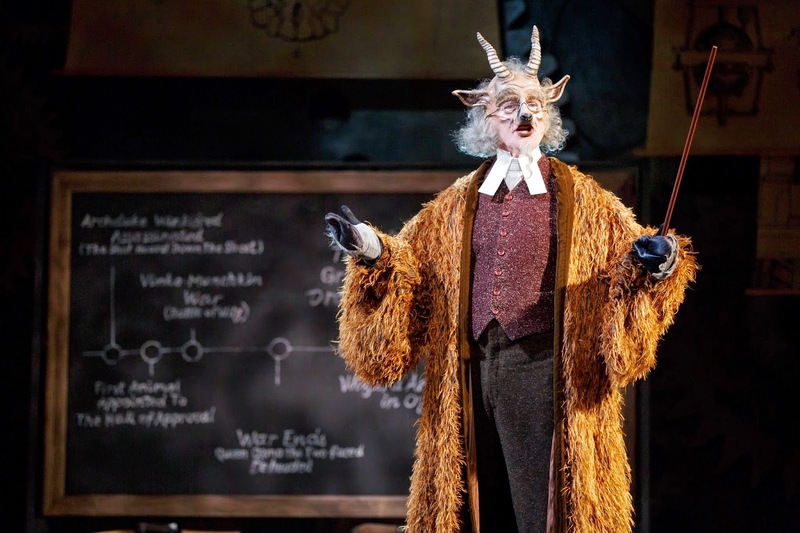 But...you may be surprised at exactly what about Alice's wonderland you learn! The magnificent hat on display was made in the 1900s, at a time when toxic chemicals were used in the manufacturing of hats. One chemical in particular was used in hat-making from the 1700s through the early 1900s. 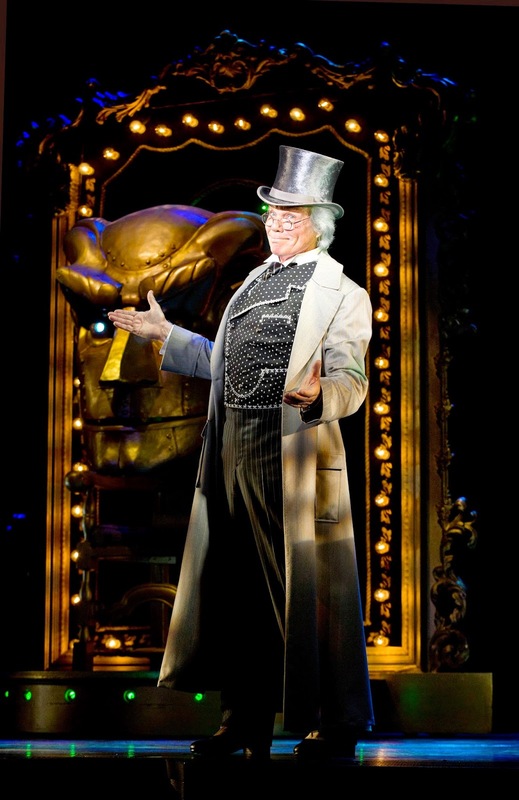 Let's suffice it to say that "Mad Hatter"—crazy hat maker, if you will—is quite founded in today-known factual evidence. But, don't assume we're out of danger just yet. That same chemical, while no longer used in the hat-making process, is still a threat today...in more ways than you might think. 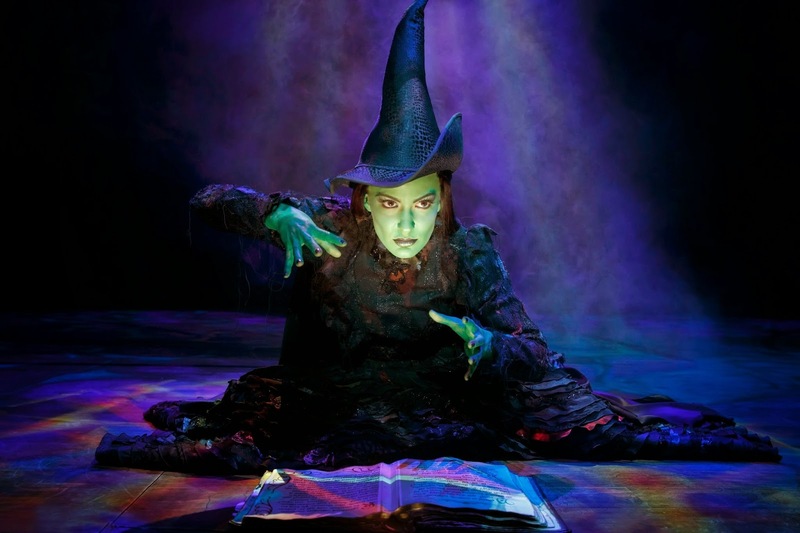 Knowledge...is...power, and you'll gain quite a lot at Fernbank! By the way, if you've never seen the Jose de Creeft "Alice in Wonderland" bronze sculpture in New York City's Central Park, be sure to add it to your must-see list. It's fantastic! One of my best friends just moved to NYC for a great new job, so I hope to see the sculpture again when visiting...after their snow melts, of course! The Choco Rainforest diorama, at the entrance of the exhibition, is brilliant! The Choco is known to be the wettest environment on Earth and it has one of the highest concentrations of indigenous species. Even more fascinating—to me—the Choco is said to have an extremely high number of species unknown to science. And I love the 3X Magnification displays! There are lots of animals on display in this part of the exhibition, some of them real and some are models...all of them fascinating. 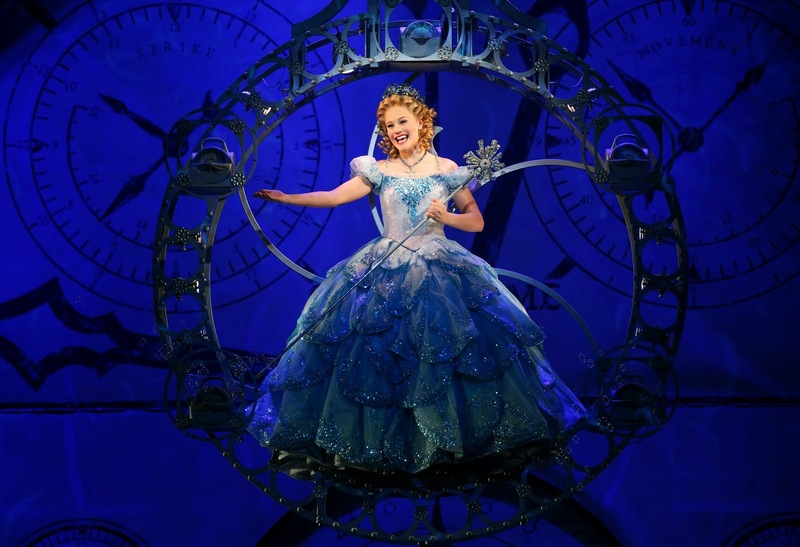 The "Enchanted Book" is going to be one of if not the most popular display in the exhibition. And it totally is enchanted...at least, even as technically wired as I am, I couldn't figure out the technology behind the this magical botanical book. The book is massive...it's probably something close to 2.5' x 3.5', maybe bigger. You get to turn the pages and as you do they come to life...from blank pages to full animation! 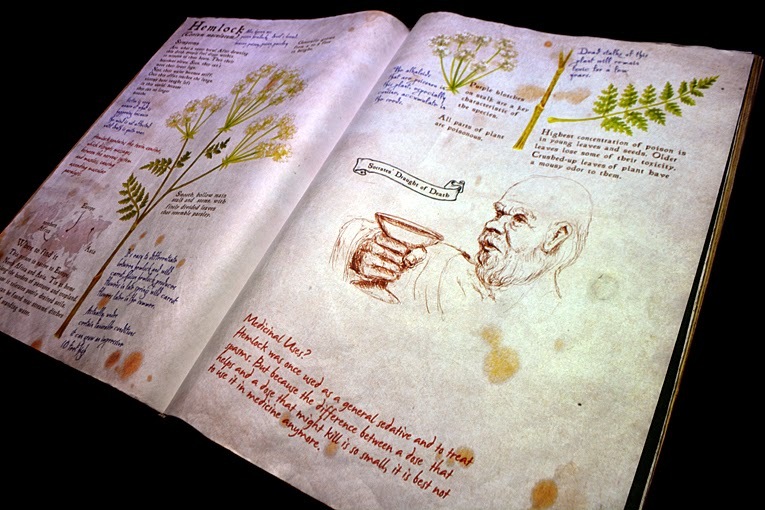 And then there are icons that you touch that reveal even more animation—additional information about the plants and herbs written about throughout the book. The experience reminds me an Arthur C. Clarke quote, who was one of my all-time favorite authors..."Any sufficiently advanced technology is indistinguishable from magic." I like to think I'm a fairly bright person, but I couldn't figure out this book's technology. 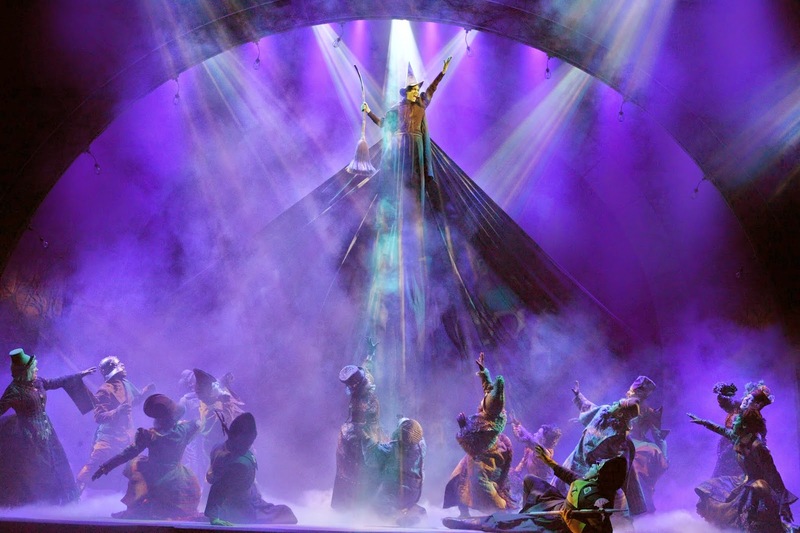 So it must be magic! We all know that there are lots of poisonous animals on the planet. Snakes, poison dart frogs, spiders and some eels, just to name a few. And of course scorpions! I got excited when I saw this display, and not because I'd just re-watched Clash of the Titans—which has some pretty incredible scorpion scenes—but because I was stung by a scorpion when I was a teenager. Twice! 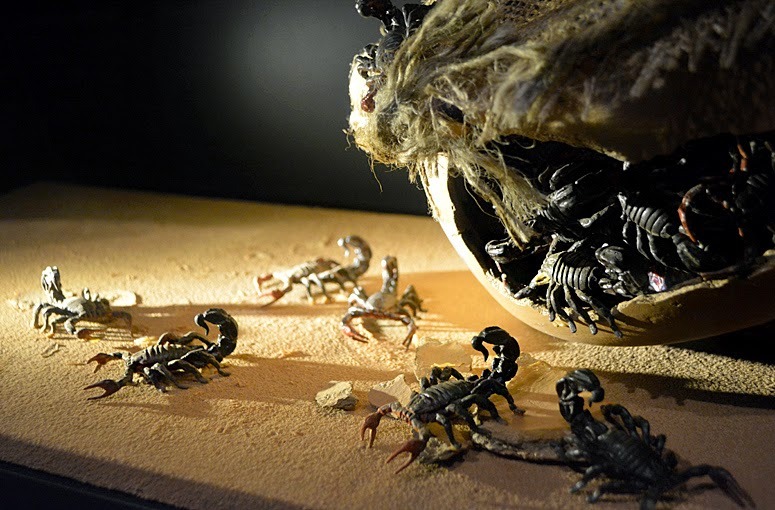 Fortunately, scorpions, like lots of other poisonous animals, are poisonous to varying degrees. The one that stung me was when I was living in Jacksonville, Florida. The doctor that my mother called explained that scorpions on the East Coast are not as poisonous as they ones on the West Coast. But I can't imagine they'd be any less painful. A scorpion sting HURTS! Throughout the exhibition there are examples of how poison is used for good, for promoting healing. As much as I remember about the exhibition, there's a lot that I want to go back and reabsorb. In the meantime, I've been having a blast doing some tangential research. This Wired Magazine article on the potential to treat cancerous tumors using scorpion venom is fascinating! Most poisonings we hear about today are accidental, but there was a time when people ingested poison on purpose. 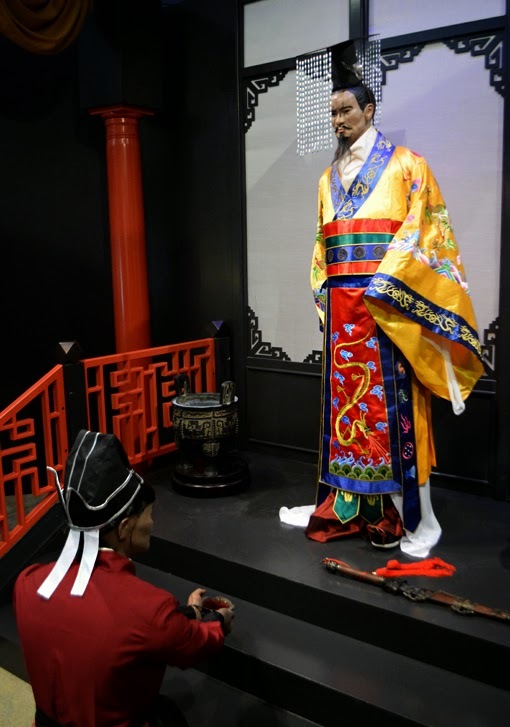 In the case of the photo above, this life-size diorama depicts Emperor Qin Shihuangdi, China's first emperor, preparing to consume what's believed to have killed him...a poison, that he thought would give him immortality. We've learned a lot about what is and what isn't poisonous since 210 BC. 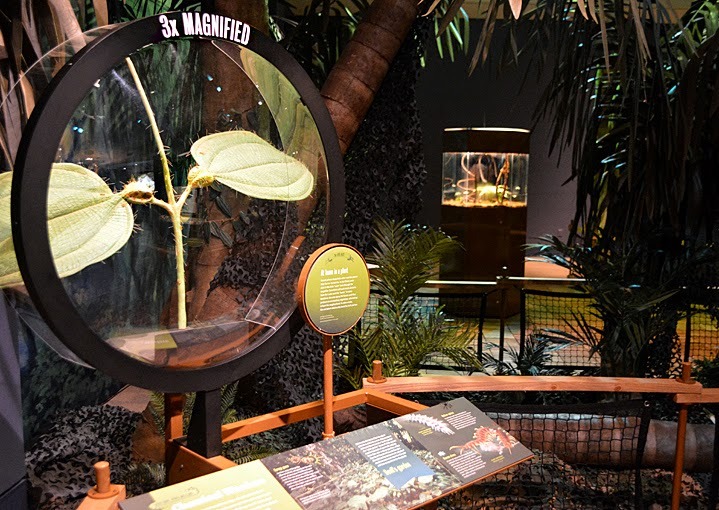 When you see The Power of Poison, please, please, please allow yourself ample time to explore—or plan multiple visits to Fernbank on your visit to Atlanta. You'll want to see the rest of the museum, too! I totally have to go back and continue exploring this exhibition...a couple of hours wasn't enough for me. There's one wall that has everything from stones to bones and books to crooks...any and practically everything to do with poison across a world of disciplines. 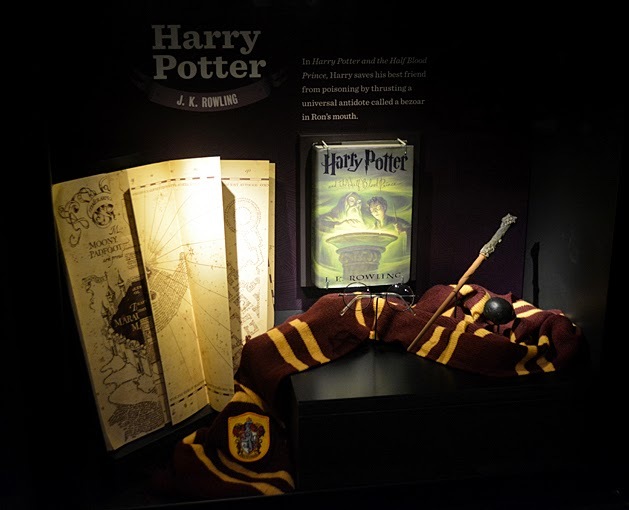 I have to admit that after seeing the Harry Potter display—which talks about Harry saving Ron after being poisoned—I've started re-watching the Harry Potter movies. This is a favorite of mine in the exhibition. 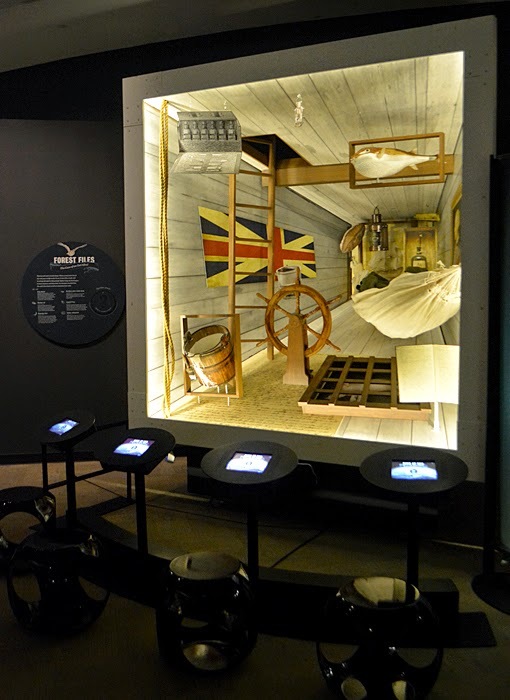 Not because I'm a former sailor, but because it's one of three interactive stations challenging visitors to solve a poison mystery! Sounds like fun, right? They totally are! In fact, the friend I went with, Glen, and I, with only moments to spare before the Museum closed (we spent a lot of time mesmerized by The Enchanted Book), successfully completed all three of the poison mysteries! And no, I'm not going to give you the answers. What'd be the fun in that? 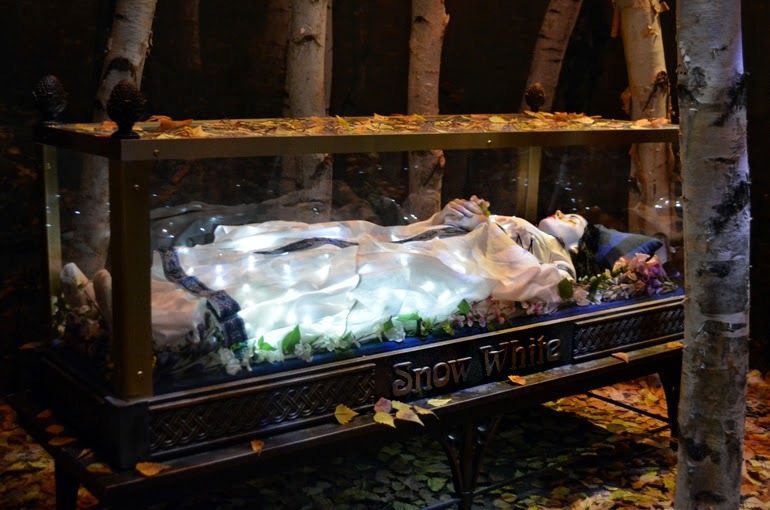 When I first saw the gentle Snow White sleeping (Remember the poisonous apple? ), I wasn't quite sure how to take-in this particular display. So many of us equate poison with death or possible death. To see a life-size humanoid figure—from a distance—was not exactly alarming, but it did give me pause. In the end, I feel that it's a wonderful teaching opportunity. For the kids who love and adore fairytale princesses and might be disturbed that Snow White is "at rest", their parents have have the opportunity to teach their kids caution, to teach their kids the power of knowledge, to teach their kids the difference between make-believe and real life while recognizing how each influences the other. I'm not a parent, so I really can't give advice here...and I don't know enough about princesses to even be clever about it. But I do remember being a kid and wanting to know everything about everything...I was curious! Okay, I guess I've not changed that much. A centerpiece in this exhibition is a trio of witches, life-size, from William Shakespeare's Macbeth and they're magnificent! I made some photos, but those particular photos weren't so magnificent. BUT, guess what? Photography is allowed in this exhibition, so YOU will have the opportunity to make photos of the trio and everything else in the exhibition! 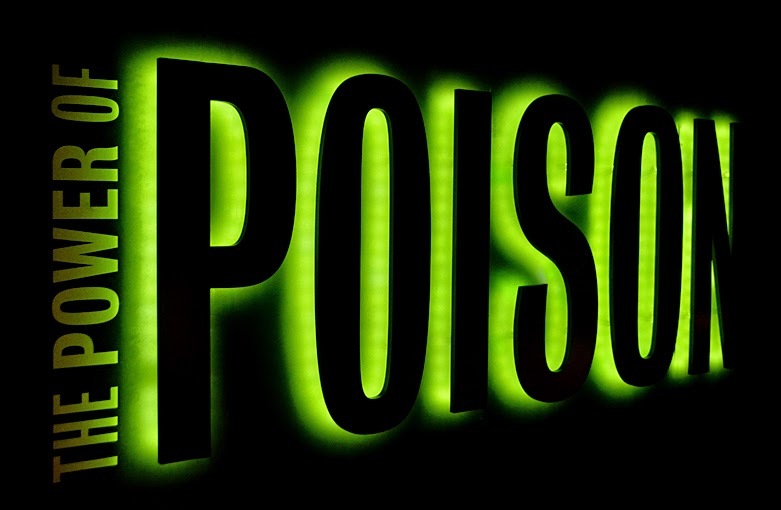 Originating from the American Museum of Natural History in New York City, Fernbank Museum of Natural History is the first stop on The Power of Poison's tour. 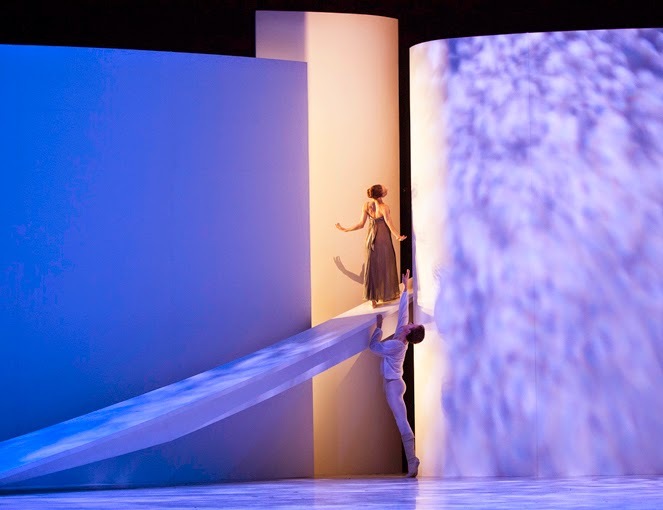 You only have until Sunday, May 3, 2015, to see this amazing show. Go...be mesmerized, learn, be fascinated, explore, be curious, interact...just don't lick the poison dart frogs, okay? 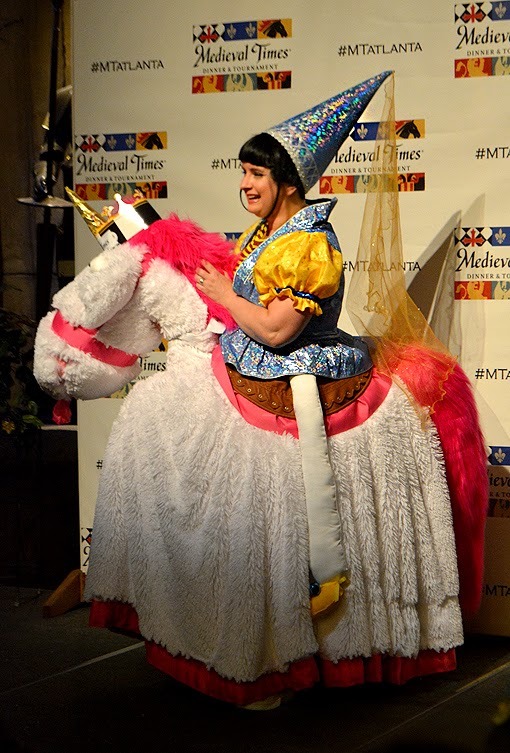 Totally just for fun, because both Dragon Con and Medieval Times are so awesome, even though it was a couple of weeks ago, I want to share with you a few photos from the Second Annual "Dragon Con Night at Medieval Times". Prior to the two-hour dinner and tournament, there was a costume contest! 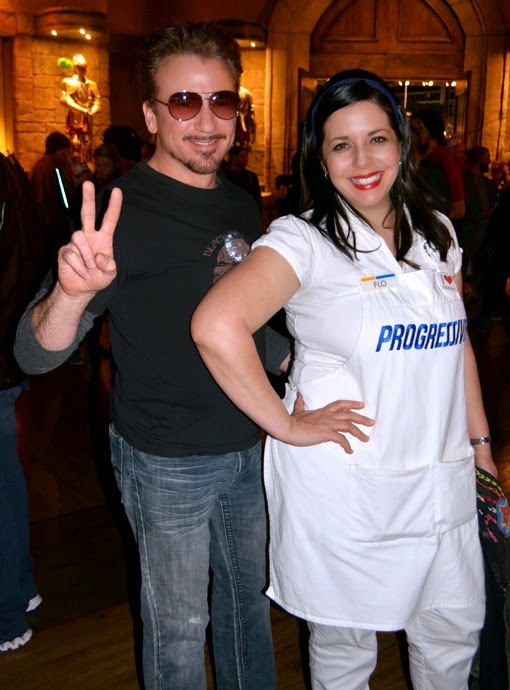 My favorite couple at the event was Tony Stark and Flo, the Progressive Girl (which happens to be the insurance company that covers my car--No, they didn't pay me to say that, nor her to dress like that). Aren't they awesome?! 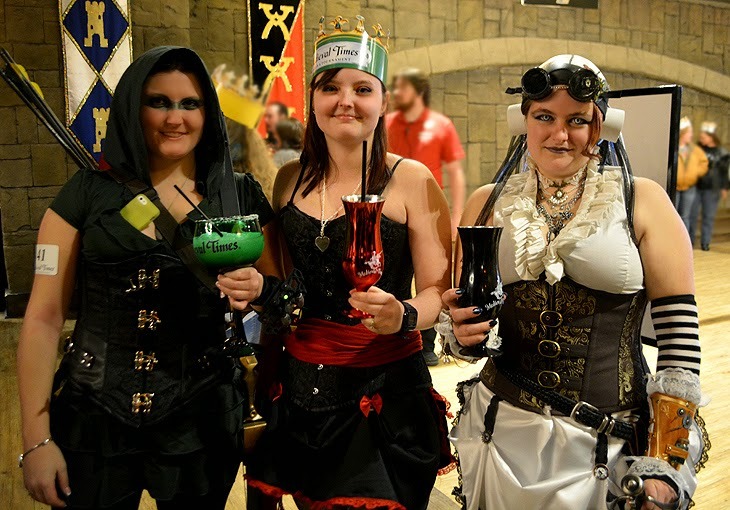 This was the second annual Dragon Con Night at Medieval Times...and I hope there will be many, many, many more! The Arena was sold out, so ALL the Medieval Times staff were there...including "Greg" (I think that was his name) the hunchback...This guy was hilarious! "Thank you!" 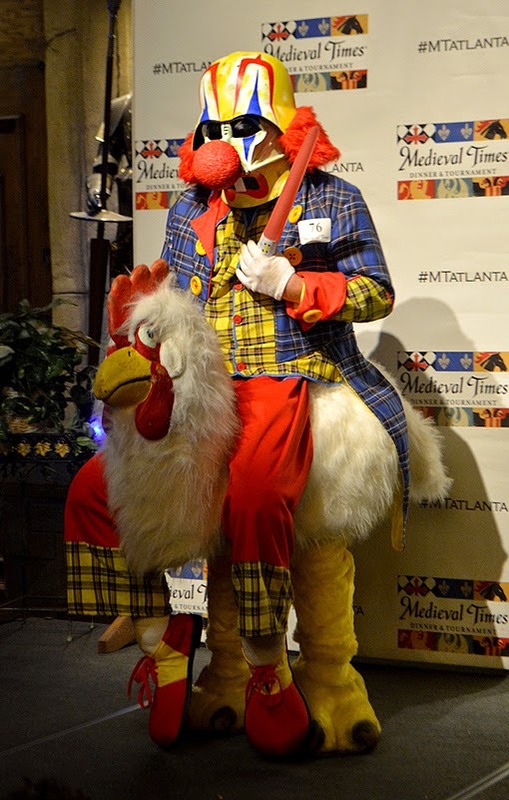 to all the Medieval Times staff--including Lady Ann, the Master Falconer--for making this a fantastic event! I have no idea what he was doing with the bubble wrap! There were many more costumes there than I'd even hoped for. I had just come from work, so I didn't have the opportunity to don my Starfleet tunic, but perhaps next year. There was only one Star Trek couple there that evening, that I noticed, but there were quite a few Medieval, Steampunk, and other similar genre costumes...all fantastic! 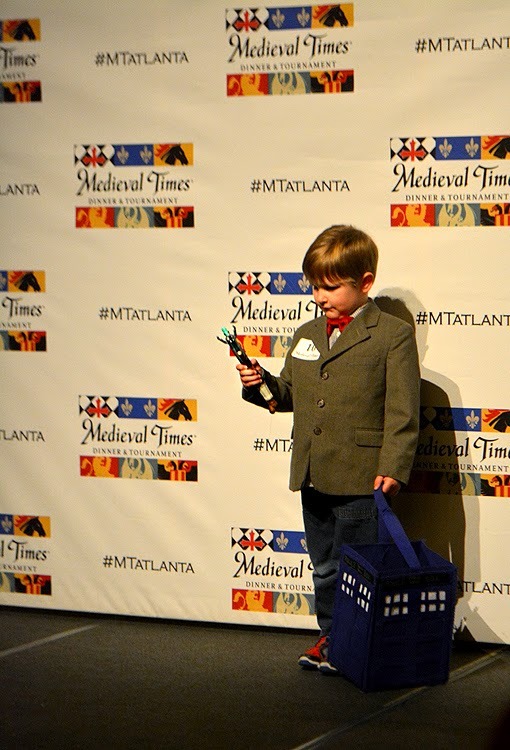 There were 10 contestants in the children's category of the costume contest..."Dr. Who" won that category, for obvious reasons...just look at that adorableness! Who else could have won?! And don't you love the Tardis bag? In addition to the 10 children who entered the costume contest, there were approximately 70 adults who entered the contest! 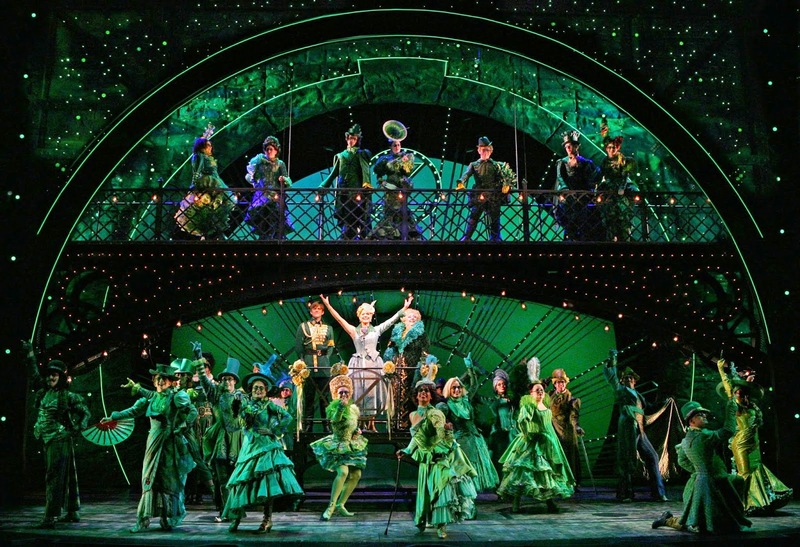 And the costumes were brilliant...absolutely and totally brilliant! 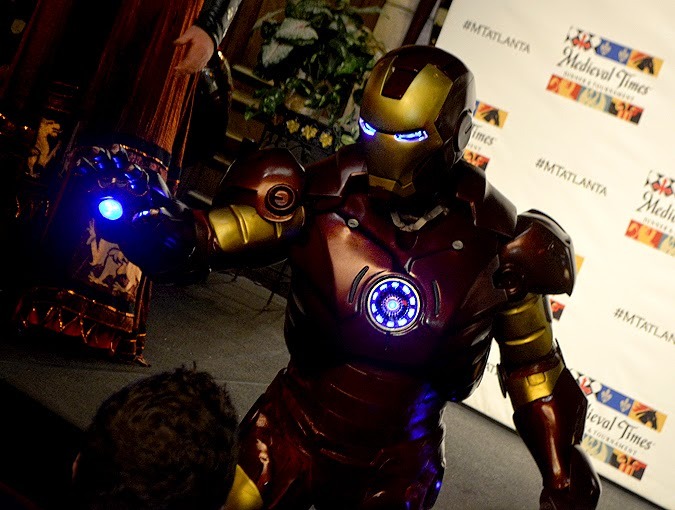 The winner of the adult category was none other than Iron Man, of the Marvel Universe (see Tony Stark in the first photo)...who crafted his costume from scratch! He totally deserved to win! What young lady doesn't want to be a princess...and have a pony?! 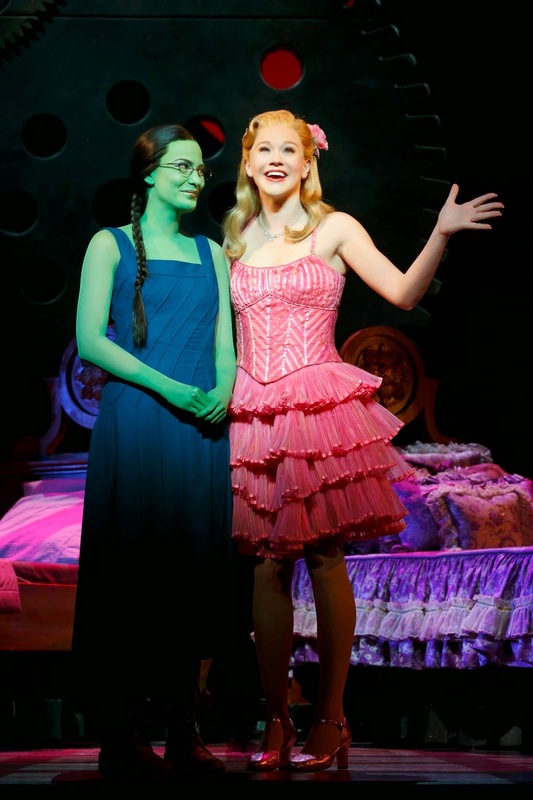 There were a few princesses there that evening, but none quite as spectacular as the one pictured above. She was marvelous! If you've been to Dragon Con you know how magnificent the creativity of the cosplayers can be. It was no different this night, or knight, in some cases. The evening's Wind Sock Dancer was a favorite and gave quite the animated performance! Some of the costumes were waaaaaay over the top! I'd seen the Clown Darth Vader from across the room, but didn't realize he was on a giant chicken until he took the stage (I'm assuming it was a "he"...could have been anyone!). This was also a crowd favorite, even if a little creepy. Okay...a lot creepy. But still brilliant. 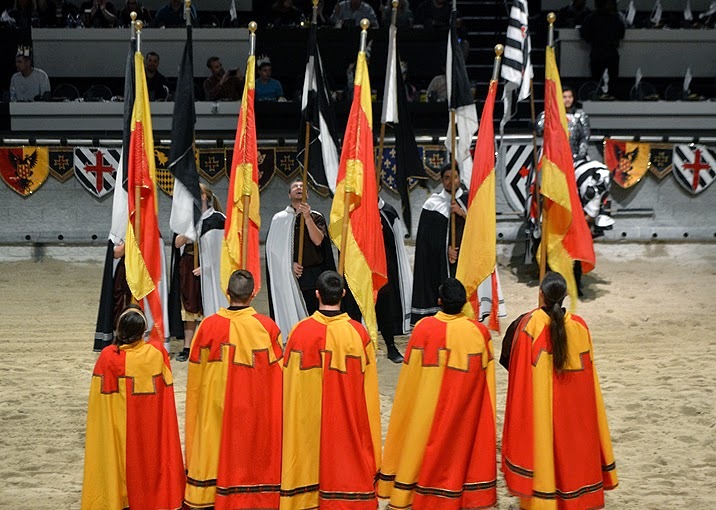 The tournament was fantastic, as it has been every time I've been to Medieval Times...now up there in number. 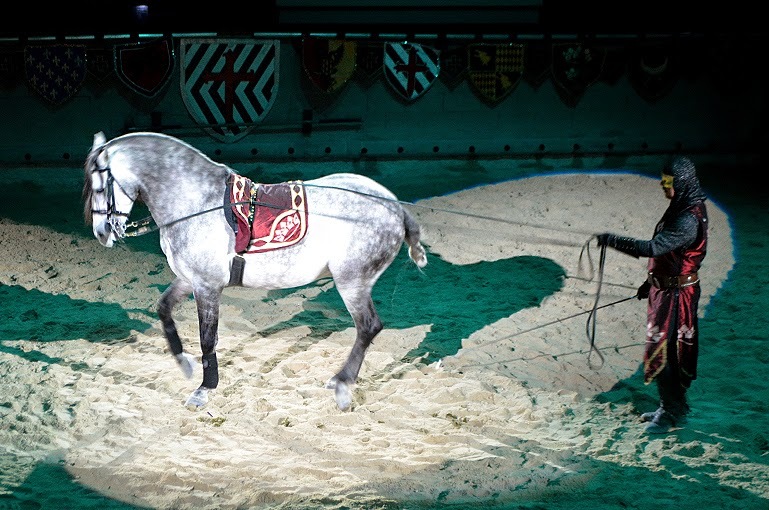 The horses are magnificent, as are the knights and their performances. 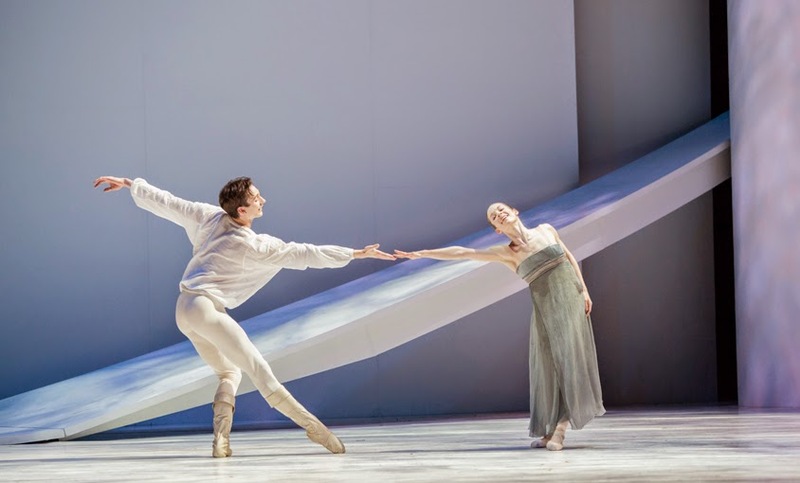 This is a fantastic show. It's great for a special event (there are birthday celebrations ranging from single digit to 60s, the times I've been there) for all ages and all special occasions. I have to give a shout out to Leah, our "serving wench" (That's her on the left carrying the red & yellow flag!). She's absolutely brilliant! She waited on my party the last time I was there and she was equally brilliant that time. 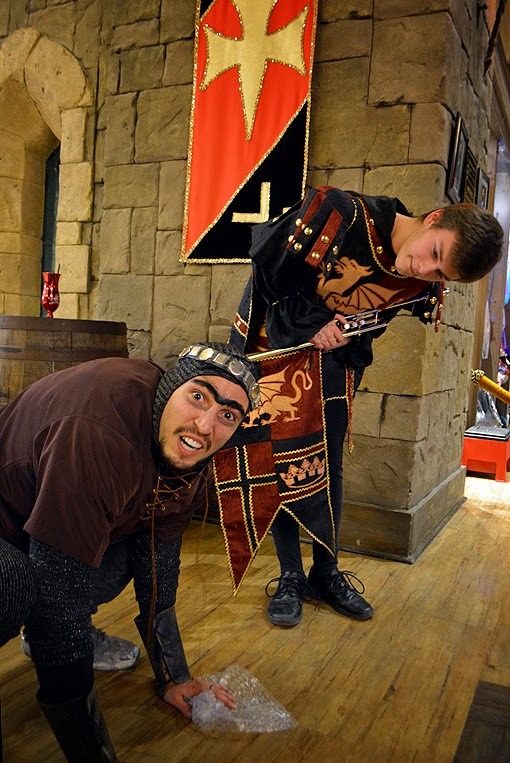 "Thank you, Leah" for making our Medieval Times experience so much fun! So...looks like a great time, right? 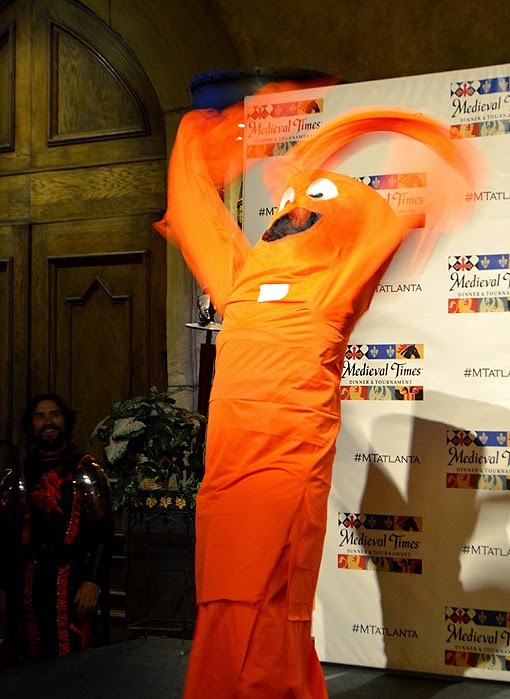 Whether you go to the Dragon Con Parade, the Dragon Con Convention, or Medieval Times Dinner & Tournament at the Atlanta Castle, you're in for a grand, unique, unparalleled Atlanta experience. "Increasingly, I've found food to be one of the deciding factors when choosing a new place to visit." That was said by Adam of Travels of Adam in a story titled, Travel for Food - The Importance of Food in Tourism. I wholeheartedly agree with Adam on this matter and am thrilled to share with you a fantastic new way to experience Atlanta's food...John Hannula's new Peachtree Food Tours! I started this post with a photo of a dish that wasn't on our first stop...because it's the best burger I've ever had in my life! 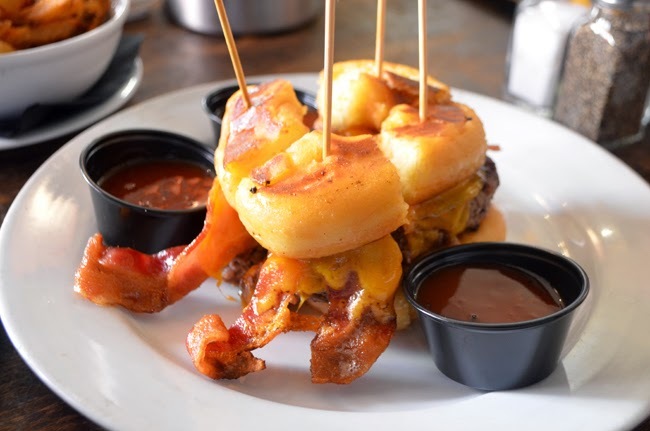 This burger, Cypress Street Pint & Plate's Sublime Doughnut Burger, is made with two Sublime Doughnut doughnuts, applewood bacon and caramelized onions! Some of you may think that it was the bacon that made this burger so good. Of course the doughnuts were a significant feature, but the caramelized onions were magnificent! And our sip on this stop was a local beer. I always prefer local beverages (and locally grown food) when available—and it fortunately is in a LOT of Atlanta dining establishments. Our tour started at a MARTA station in Midtown, easy for visitors to get to if they haven't rented a car for their visit, and it beats having to figure out parking! Our first stop...The Varsity! 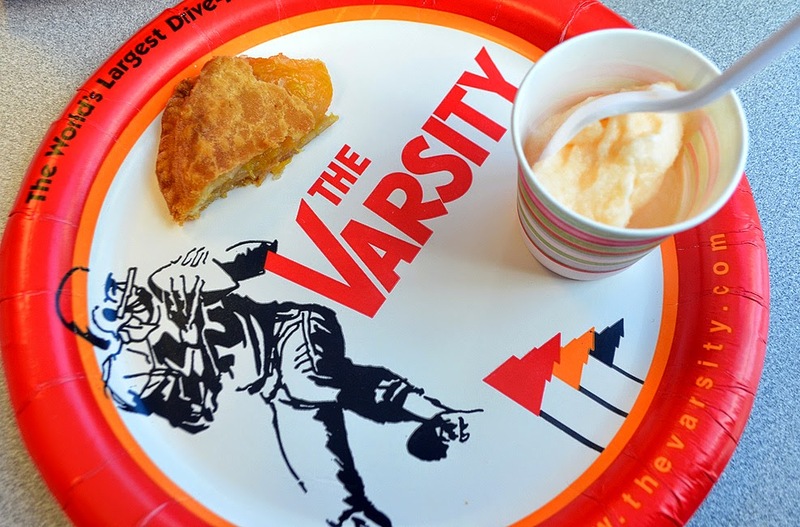 This place is an Atlanta icon and a has a legendary provenance, and it's the original The Varsity and it's definitely "an experience!" To give you an idea, their brochure shares this: "Two miles of hot dogs, a ton of onions, 2,500 pounds of potatoes, 5,000 fried pies and 300 gallons of chili are made from scratch daily." I encourage you to read up on the restaurant's fascinating history, too. 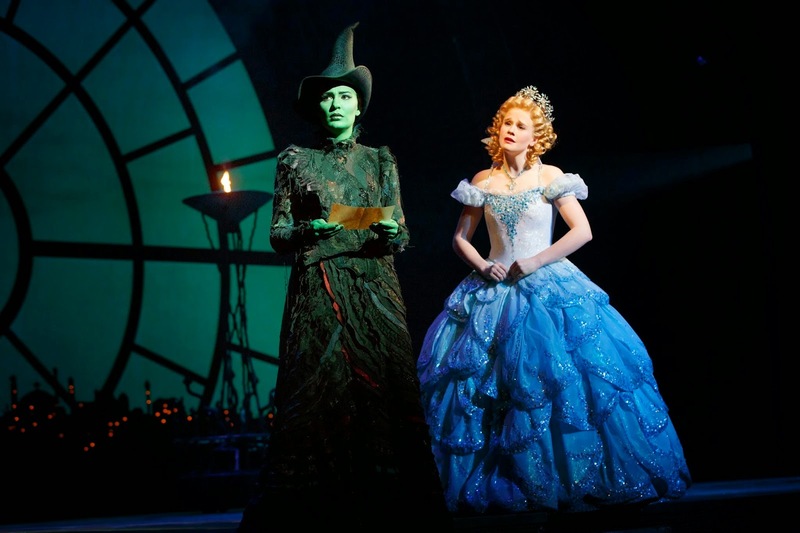 It may not seem like the most illustrious first stop, but believe me, you're in store for a memorable tour! "All three of my grown sons are entrepreneurs, never really having had a boss. So, I retired in 2008 as the Operations Manager for a small company that built luxury homes and in 2009 the conversations with each of my sons went something like this, 'Dad, you're too young to be retired. You should start your own company.' My response was typically, 'And what would that company do? No more houses for me so what do you suggest?' Their retort was, 'We'll figure out something for you to do!" 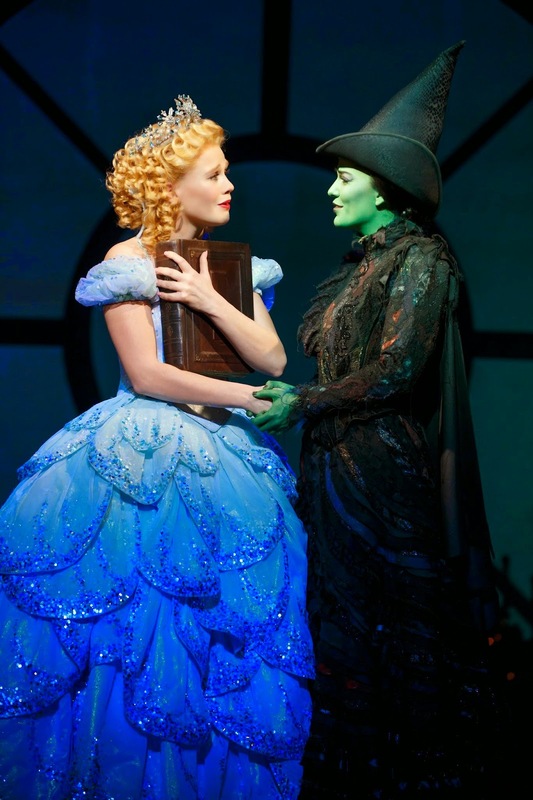 The key to life is often in just the listening!" Many of you know how much I enjoy Livingston Restaurant, in The Georgian Terrace. I was thrilled to learn that it was on that day's tour! 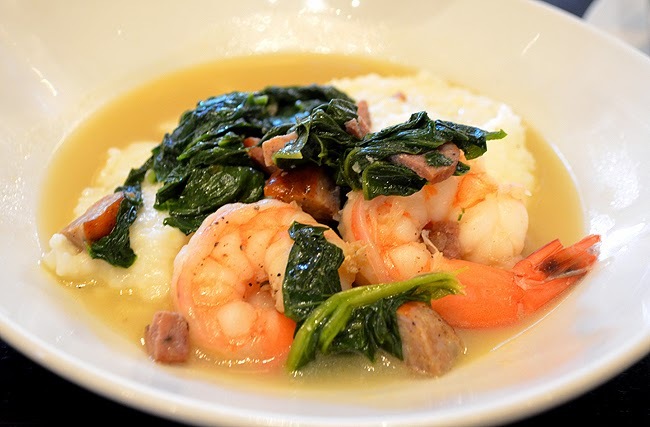 And delightfully Southern that we would enjoy Shrimp & Grits! Our sip on this stop was a Riesling, which I rarely drink—I've not had many that I truly enjoyed—but this one was great and paired nicely with the Low Country dish. In addition to a recent birthday brunch, dinner and drinks at Livingston has become a tradition for me before every show I see at The Fox Theatre, and other times just because. 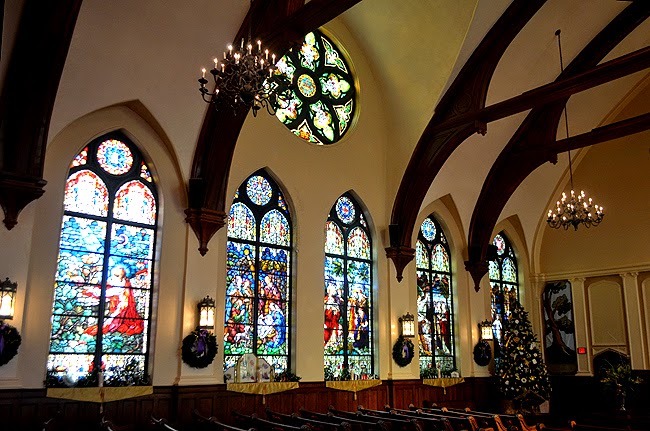 As you can see from the photo above, we were treated to a tour of Saint Mark United Methodist Church, a church that I've long wanted to see the inside of. It’s beautiful. Peachtree Food Tours is a delightful mash-up tour of food, drink, architecture and history. "I am convinced that today's information bombardment has created a much more sophisticated traveler, maybe not in the fine dining/wine aficionado sense, but in the 'I want the back story, I want to be entertained while learning, I want to easily relate the cost of the tour to the total experience, and I want to have something cool to tell my friends when I get home' type of traveler. My hope is that my guests have a really great story to tell others about the incredible, crazy, yummy, history-driven experience they had with John. Even if they only remember a third of what just happened to them!" Valentine's Day! Let me tell you about a sweet treat that John has in store for this Valentine's Day tourees. After their food tour, he's treating them to a shopping experience! And that's not all. 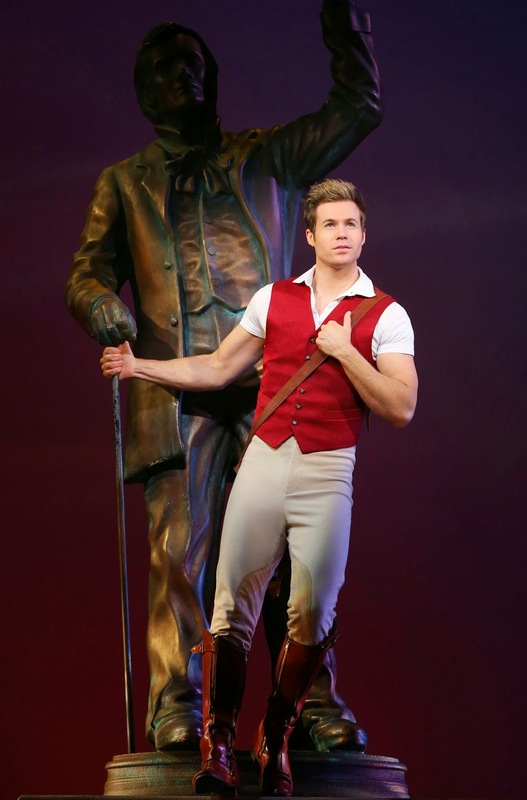 He's also giving tourees—complements of John himself—special gifts at EVERY tour stop! How sweet is that?! There are only a few tickets remaining, so if this sounds like something you want to do, sign up soon. Speaking of limited tickets, these tours are an intimate experience. There are only eight slots per tour, including John. You not only get to enjoy Atlanta's awesome cuisine, you're very likely to make a new friend or two. 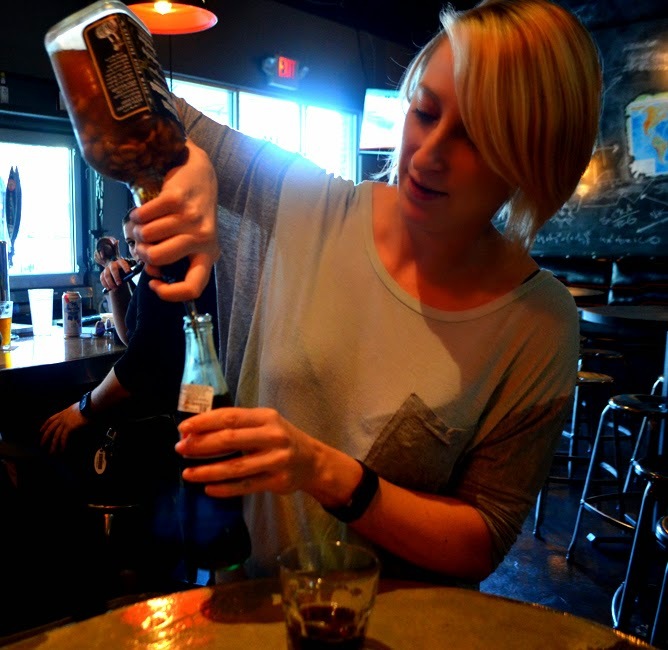 Peachtree Food Tours is a tastes and sips experience. 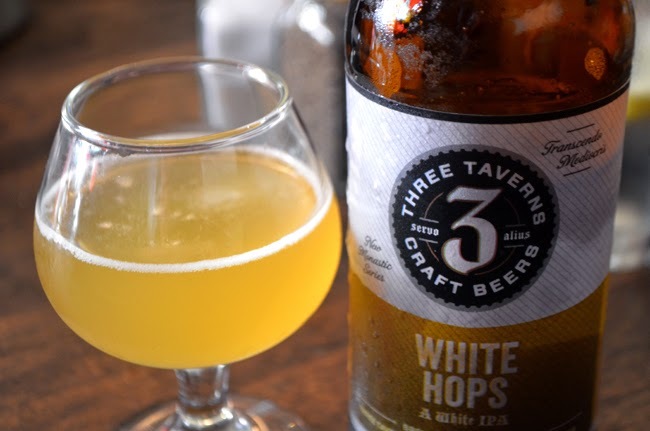 The sips range from local craft beer, such as the Three Taverns' White Hops we had at Cypress Street Pint & Plate, to wines, bubbles and other fun libations. It sounds like a lot, but they're sips and after walking a mile and enjoying so many tastes, you've had a delightful, filling sampling of some of Atlanta's most fun and fine culinary offerings. Our sip at Villains was a called "Prohibited at Turner Field". John will share the back story on this one, a story I'd never heard. It's fashioned after a childhood treat...salted peanuts in a bottle of Coca-Cola, but they use Mexican Coke. I believe I was one of the only tour guests who was familiar with this Southern "traditional" way of enjoying a Coke. Of course, when I was a kid, we never had it with bourbon, but I wasn't complaining as an adult. Villains closed its doors shortly after I toured with Peachtree Food Tours, but the owners didn't vacate. They're reopening, very soon from what I hear, as Hi-Five Diner. I know that kale is considered to be a super food, but I've never really "enjoyed" it. Not until I had Villains' HAIL NERO, aka "Asian Caesar Salad". It's chopped kale, ramen "croutons", white miso dressing and chili flake…the best kale I've ever had! There's great news for future Peachtree Food Tours tourees...when Hi-Five Diner opens in the same space, they're keeping the same sip and taste on the menu! 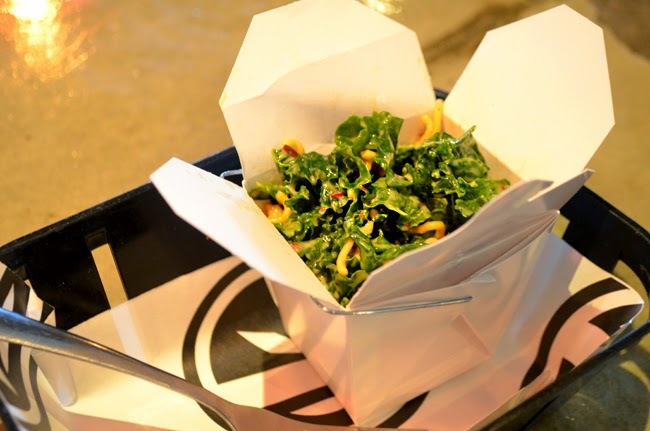 So, you too may very well have the opportunity to experience a grown-up version of Coca-Cola & Peanuts AND the awesomely delicious Asian Caesar Salad! Seriously...It was so good that I wanted to lick the box! I've already shared with you that this is more than just a food tour. The food tour alone is fun, but John wouldn't have be only that. He wants his tourees to experience so much more. Our quick turn around Rockspinner was like being a kid again! Rockspinner—technically not the first made, but the first with that designation—was created by artist Zachary Coffin for the 2001 Burning Man. 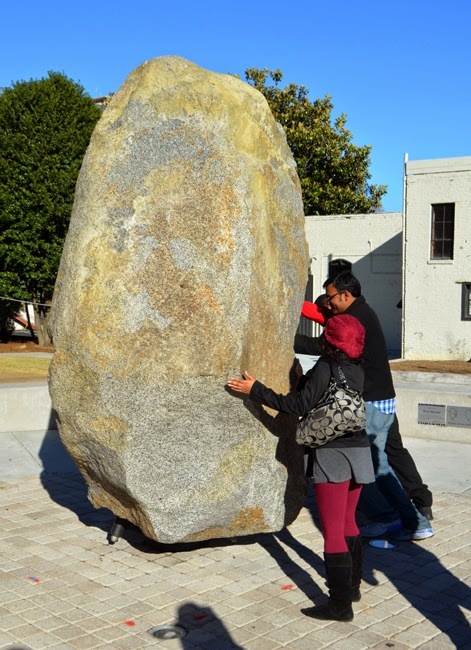 This 22,500 pound boulder is a wonderful piece of public art at the intersection of Peachtree and 10th Street. And just to clarify...yes, this giant rock spins! The obvious target audience for Peachtree Food Tours is out-of-town tourists, BUT, as a longtime Atlanta resident, I can say with great confidence that local tourists will enjoy this as much as someone from New York City, San Francisco, Chicago, and any of the other populated continents. I asked John how he and Peachtree Food Tours would describe Atlanta's food philosophy. He said, "I like the iconic fried peach pie as a Southern start, and then moving on to some fairly sophisticated presentations of classic Southern food. I'm selling Peachtree Street and will continue to narrowly focus on what the South does for fun and fine food. 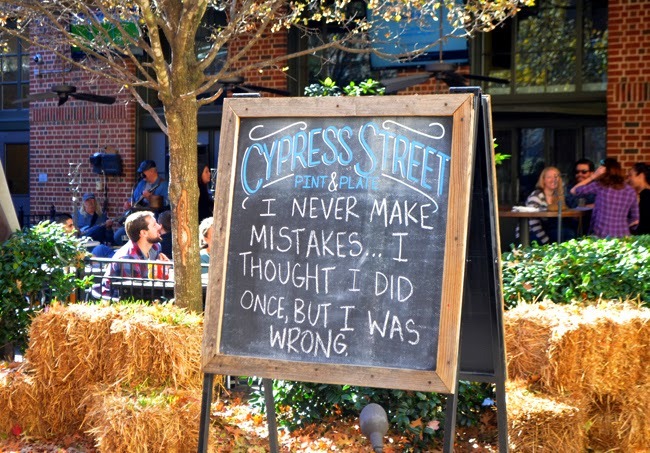 That's a Peachtree Food Tours mantra." "Fried Chicken and Champagne...Why the Hell Not?!" is one of the first things you'll see when you visit Max's Wine Dive's website, in addition to a far superior photo of the same subject matter. I don't know why I didn't think of fried chicken and champagne...I love both. So sure, why not?! 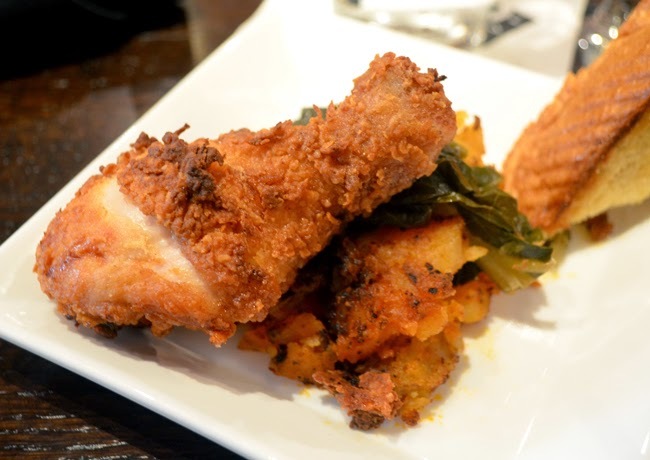 There are a LOT of restaurants in Atlanta that do friend chicken, and many do it quite well. This was the first restaurant I've encountered that suggests a champagne pairing, but even without the champagne, their friend chicken is awesome! For the record, for our taste and sipping experience our sip was proseco, and quite a good one. I'd been wanting to go to the relocated Cafe Intermezzo for a while, so I was thrilled that it was on the tour! I'd been visiting the former location on Peachtree near Collier Road and Piedmont Hospital—now Cafe M Rouge Bar & Bistro—since the late 80s. I always loved the European feel of Cafe Intermezzo, and John tells me that some of his international tourees have said the same of the new location of this dessert mecca! I forget the name of the dark chocolate dessert I enjoyed, but I fully recall that it was amazing! The mile-long food tour isn't the end of the experience. One of the things that John does, that I think is brilliant and I do not recall happening after other tours, is that he sends a follow-up "Thank you" email. I've of course received thank yous, but it's the recap of the tour that you just experienced that's such a wonderful capstone of Peachtree Food Tours! In one of his earlier comments, John said, speaking to the immensity of the four-hour food tour, "Even if they only remember a third of what just happened to them", tourees will remember a wonderful time, and he's right. We experienced so much, that I would not have remembered everything. AND knowing that the recap email was forthcoming meant I didn't have to take notes...his recap email did that for me! If you do find yourself basing a travel destination decision influenced by food, I for one think you'll be quite pleased if you choose Atlanta, and Peachtree Food Tours. I personally had the distinct pleasure of the company of fellow foodies, a history lesson on my beloved Atlanta, and a "Peachtree Food Tours" tour that I can hardly wait to repeat! Get ready to, as John says, "taste...sip...explore!"